The Black Moon Handbook is a book written by occultist Steren Slaìne and annotated by alienist Enyl Mac Bedwyr. They have distinctly conflicting points of view on the nature of the strange phenomena that occur in Tri-Kazel. This confrontation offers arguments and methods of investigation, both to aficionados of the paranormal and to its detractors. 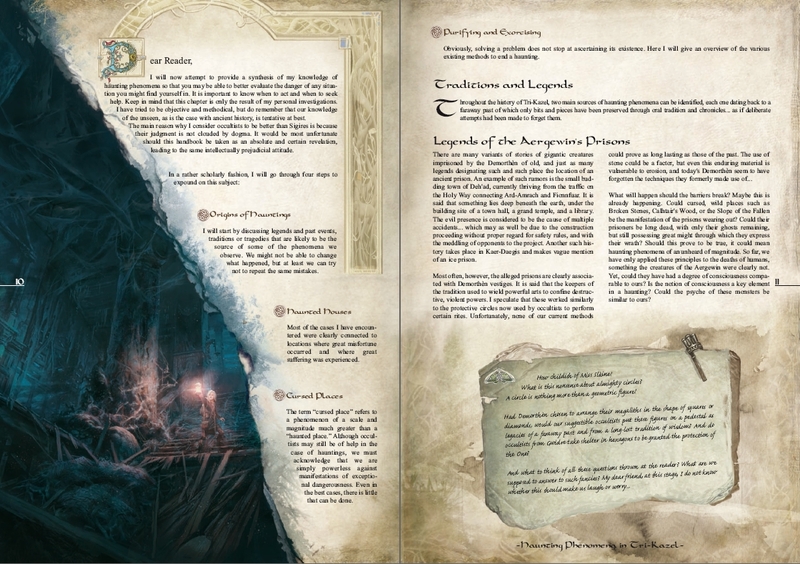 Although it is primarily intended for Game Leaders, this book can also be made directly part of the game by having the Characters find it and then allowing the Players to read it. A chapter introducing how hauntings manifest and how exorcisms can be carried out. It provides ingredients and advice to enrich and diversify eerie atmospheres, from mere oddities to spectacular supernatural manifestations. 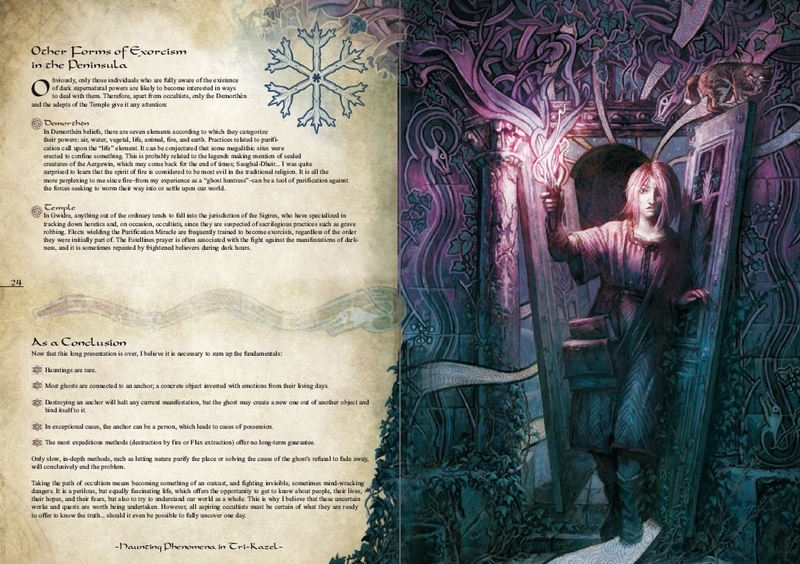 A chapter detailing five Tri-Kazelian figures, each with a particular connection to occult phenomena: Steren Slaìne, the author of this book; Amy Dust Mèirleach, a Varigal who escaped the Ashen Yard; Brother Arathos, a former Sigire turned sorcerer; Keïr Mac Farquam, knight and last of a cursed line, and Yzvael Mac Baellec, an assassin wracked by madness. 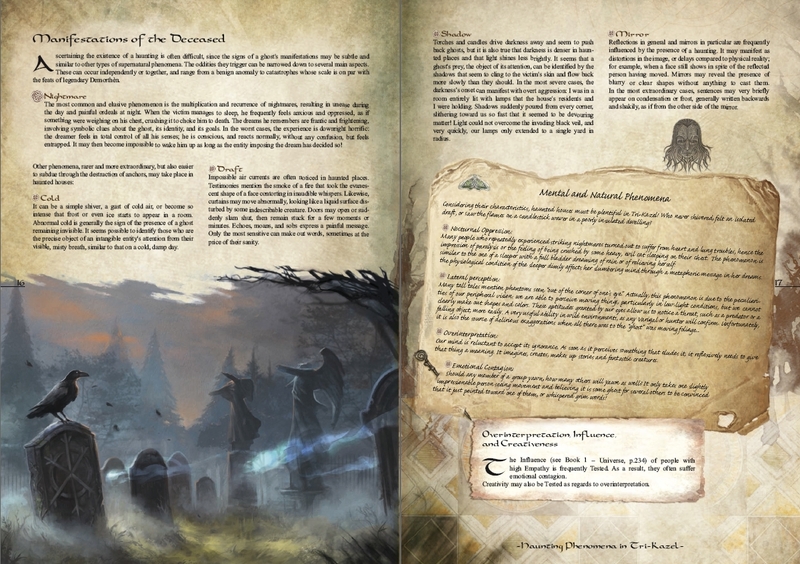 Four short scenarios complete with game aids offering unique plots woven around occult phenomena. The book ends with the profiles of four creatures which are the objects of many legends and much speculation. Each one is connected to at least one of the Canvases or Figures. Hi, I just bought the hard cover version in my local games shop. I love this book it really grips the horror side of the game gives it to you. I would love to buy the PDF version to make up a players version of the Black moon. I'm hoping you might give a discount for buying the hard cover ? This title was added to our catalog on November 06, 2015.